Microsoft has dropped all support for desktop gadgets. Even so, I like to have some information ON my desktop while I do things on my computer, I am a "data junkie" and I need to know what my CPU and some other stuff are doing. I think many peoples will agree with me. Fortunately solution is simple. With 8GadgetPack you can have, on your desktop, the Windows Gadgets made for Windows Vista ... back in Windows 10 or 8.1. 8GadgetPack comes with few official gadgets made by Microsoft and few gadgets made by users. 8GadgetPack is a software program developed by Helmut Buhler. It adds registry entry for the current user which will allow the program to automatically start each time it is rebooted. After a while (it can take some minutes) the installer will be complete and you need to click on Finish. 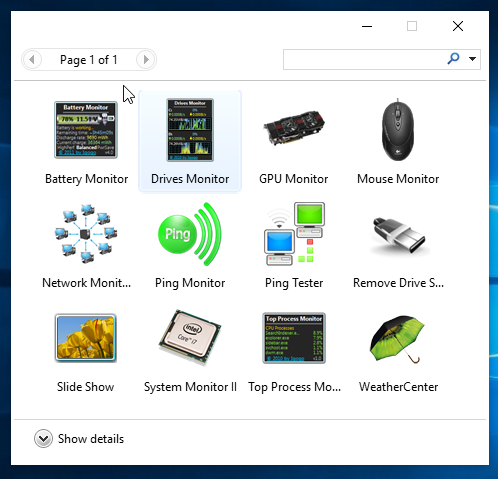 8GadgetPack integrates into the desktop context menu and Control Panel. That is, you can quickly access Gadgets window by right-clicking on the desktop, and clicking Gadgets. 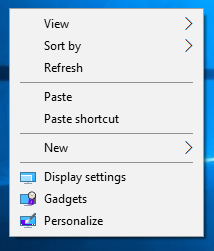 The other cool feature is that you can also hide all gadgets on the desktop by right-clicking on desktop, clicking View, and then clicking Show desktop gadgets. 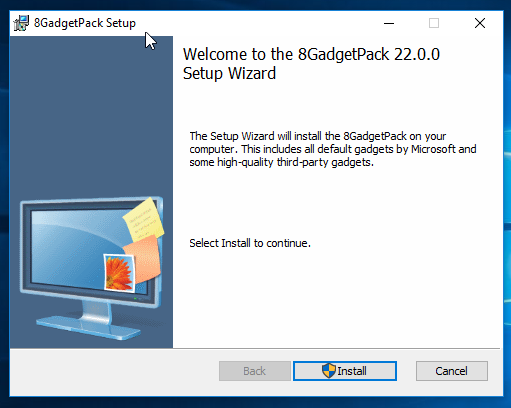 When 8GadgetPack is installed you can open and install .gadget files made for Windows Vista or Windows 7. To access the directory where the gadgets are saved, open an explorer window, click on the top at the address bar and paste the following text: "%userprofile%\AppData\Local\Microsoft\Windows Sidebar\Gadgets". 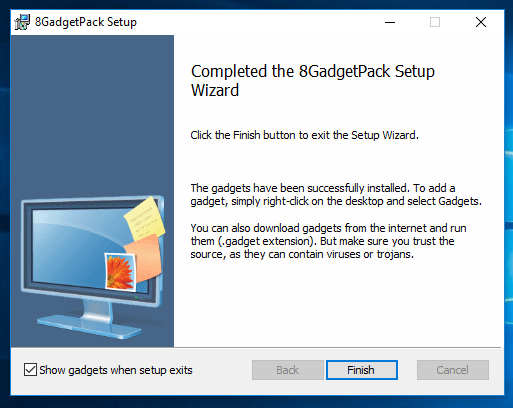 8GadgetPack flawlessly integrates into Windows 8.1/10 without causing any issues. It has a good reaction speed, delivers accurate information, and uses a low amount of CPU and RAM. How to bring gadgets back to Windows 10 - read more. To guarantee the development of all the gadgets in the future we need your help now. Please donate today - any amount is welcome. Thank you! ﻿	Copyright © 2010-2019 Igor "Igogo" Bushyn. All rights reserved worldwide.